In home CPR Workshop. Parents learning how to prevent injuries and save the life of their child. Learning about common first aid emergencies and how to prevent and treat them in your children is an essential skill for parents. 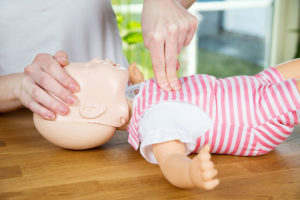 In a Babies First CPR and Safety Workshop you will learn CPR, Choking treatment, and emergencies like: a bleeding cut, how to know if a child needs stitches, broken bones, breathing emergencies, handling fevers and much more. We offer workshops in your home for you and your partner or even for a small group of friends of family members. You can also join one of our fun evening or weekend workshops in a group setting and save money with the group rate. 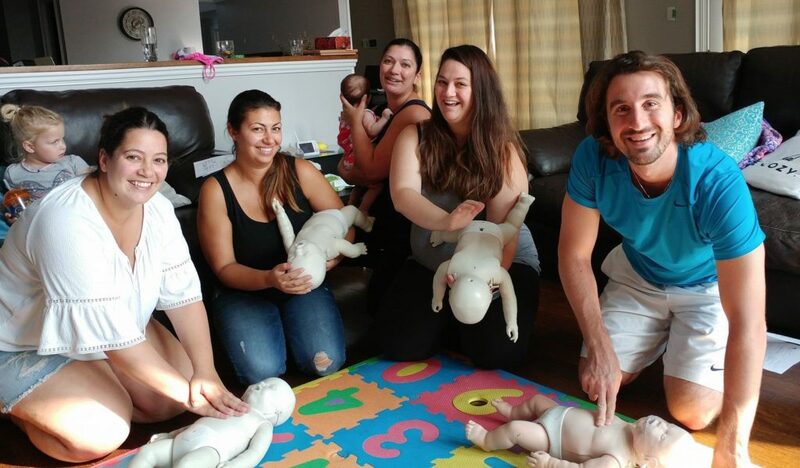 Babies First CPR workshops are approximately 2 hours long and include practice with life like manikins, videos, hands on practice and an informative handout to take home with you. The CPR workshop is taught by a certified CPR instructor with 15 years of experience. Gain the confidence to handle any emergency situation with your baby or child, Register today! Group classes available in Newmarket/Aurora and Richmond Hill, in-home classes available across York Region. May travel outside of York Region for large groups.